Start by jacking up the corner, supporting with a jack stand and removing the front wheel. 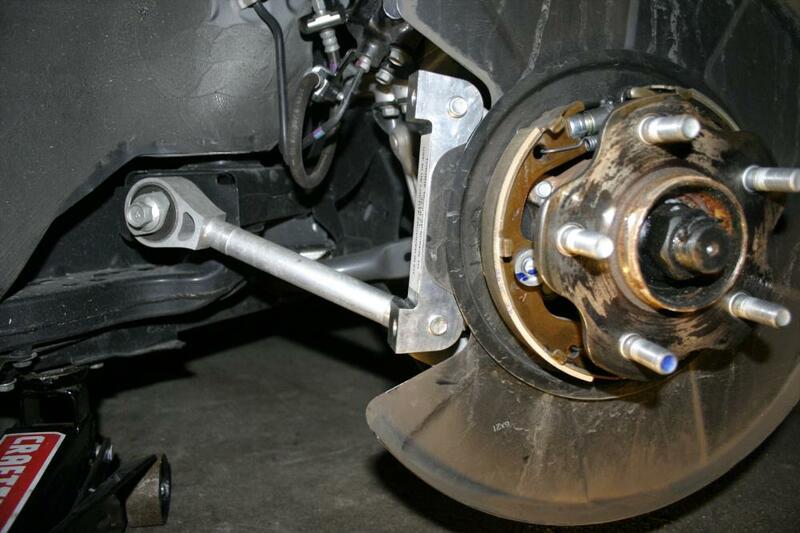 Loosen the lugs before you get the wheel completely in the air, especially if you are doing this by hand. You should be starting with something like this. 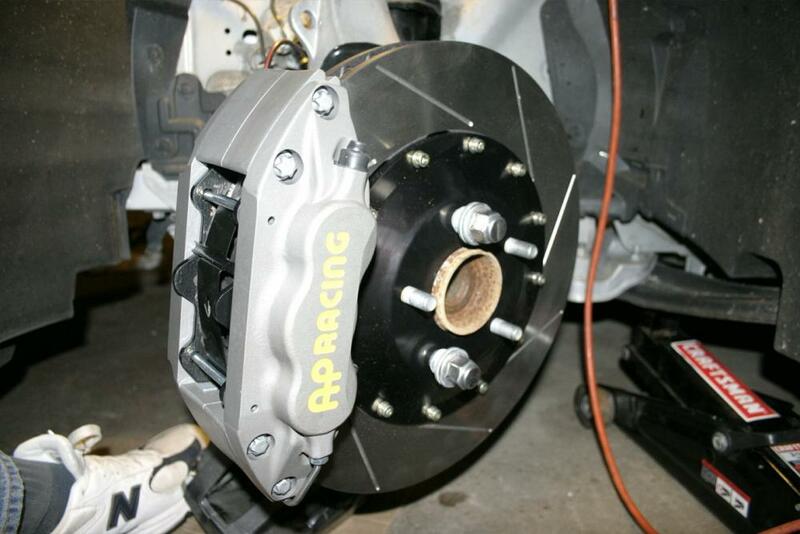 I have the Akebono sport calipers, but the base procedure should be similar. 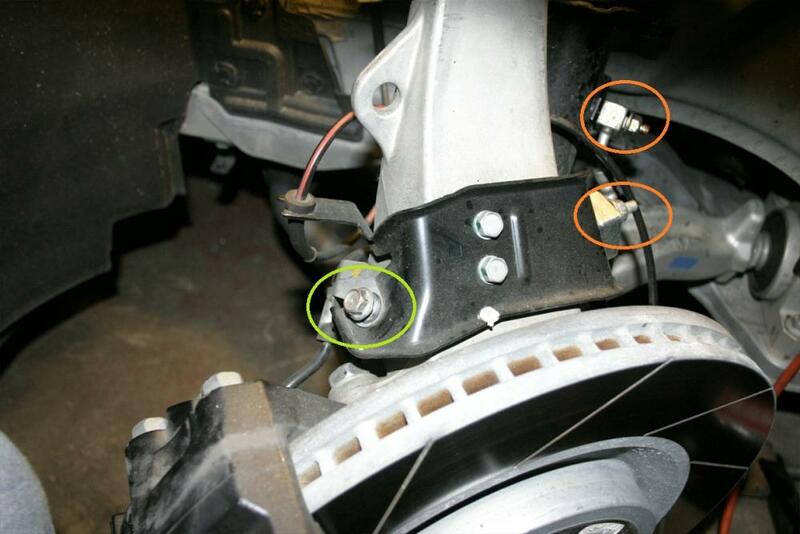 Remove the 12mm bolt (in green) and discard. 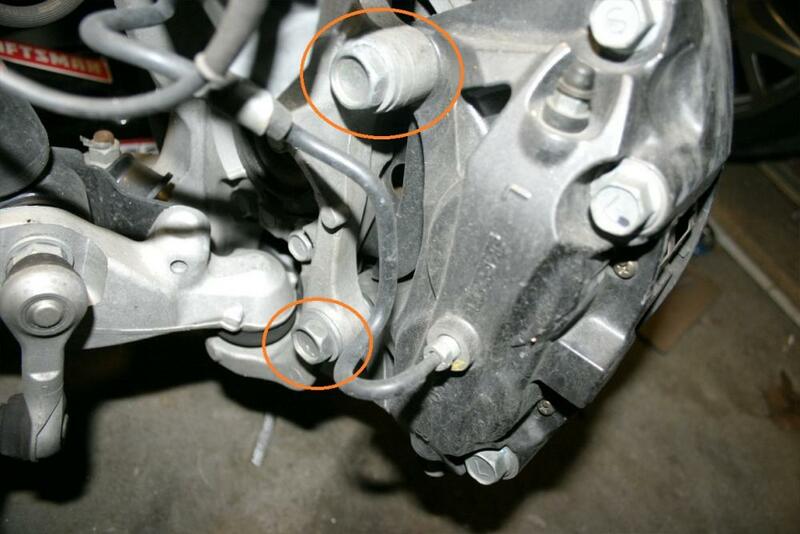 Remove the 12mm nuts holding the brake line blocks and set aside (orange). Pull the rear block off the post now if you can. 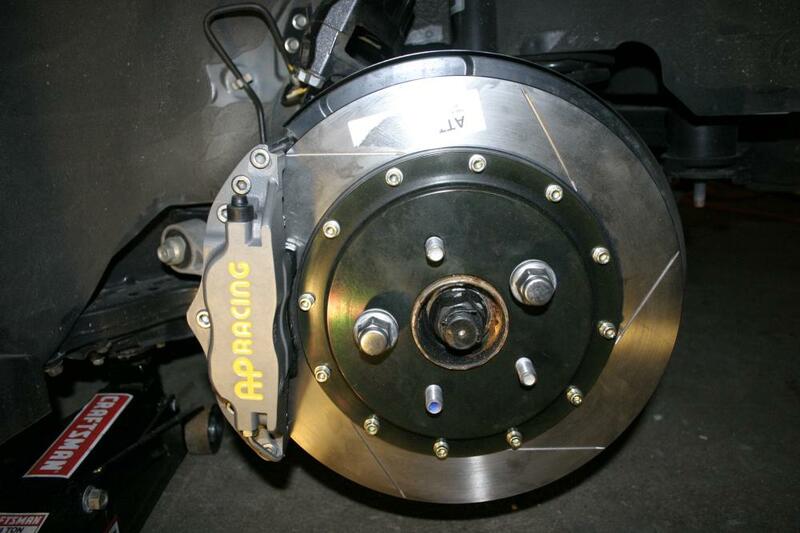 Take the steering lock off so that you can turn the caliper out towards you for easy access. 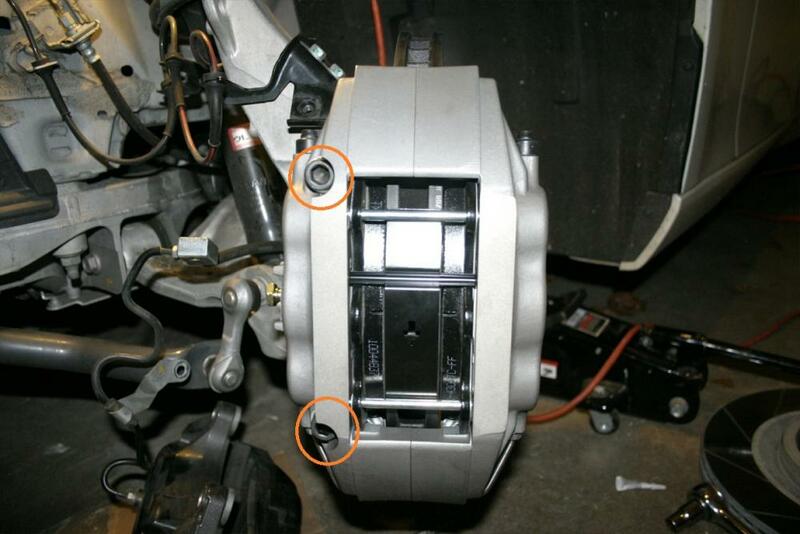 Locate the 2 caliper bolts and remove with a 22mm socket or wrench. 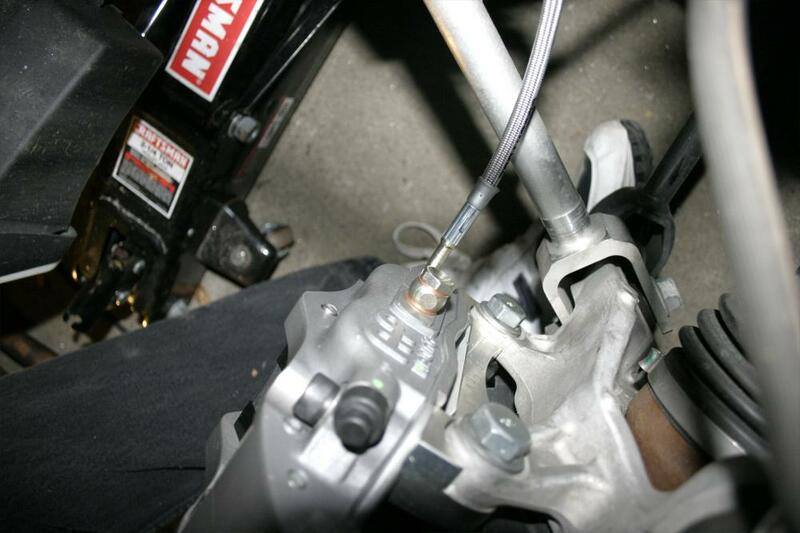 Keep the brake line attached for now, and while holding the caliper remove the front brake line block from the post. Set the caliper on the ground resting on some cardboard or similar. Before starting make sure you have the correct kit box for the side you are working on. The left and right kits are distinct and should be marked on the box. First step is to install the aluminum caliper adapter bracket. But before you can you will notice that the factory dust shield is in the way. You could trim this, but it bends very easily and can be bent out of the way by hand. Don't worry if it touches the bracket. Install the bracket reusing the 22mm bolts from the factory caliper with some red loctite on the threads. Torque to between 70-80 lb/ft. 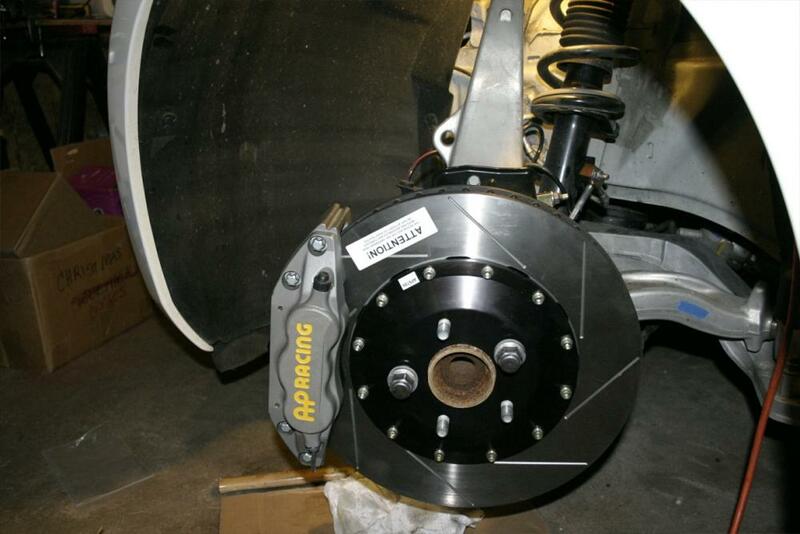 Install the new rotor, make sure it is pushed all the way flush. Temporarily support with a couple of lug nuts. Turn the rotor and check for any rubbing on the dust shield. Grab your new caliper and a 12mm hex cap screw from the bag of goodies and loosely tighten the caliper to hold it in place. Grab your 2nd 12mm cap screw and apply some blue loctite and torque to 45-50 lb/ft. 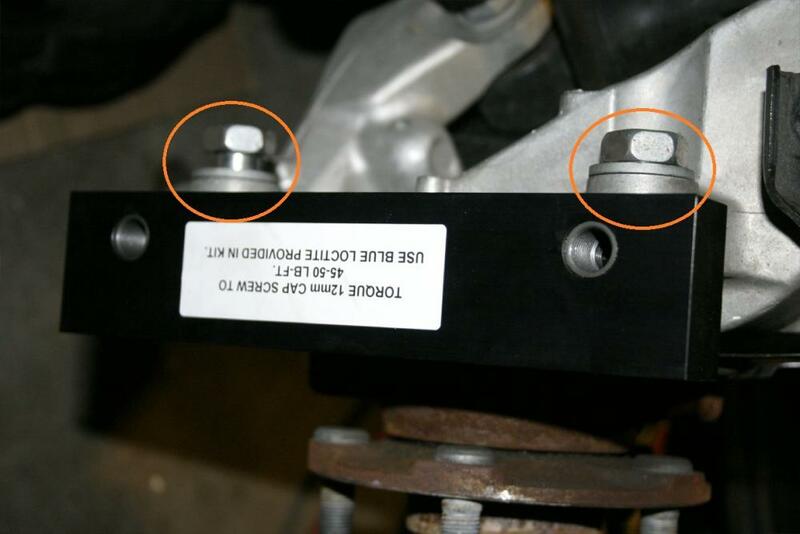 Remove the temporary cap screw and apply loctite to the threads and reinstall this time torquing to final specs. Next install the SS brake line, route it around the back of the steering knuckle and to the mounting point on the shock absorber. Slide the block adapters over the posts and attach with the 12mm nuts removed previously. 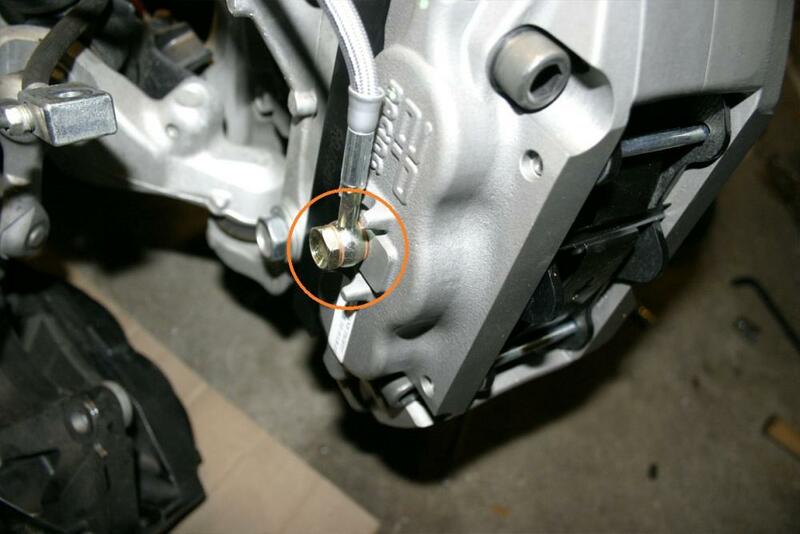 Attach the caliper end of the brake line with the banjo bolt and copper crush washers already attached to the caliper. Torque the banjo bolt to 18 lb/ft. 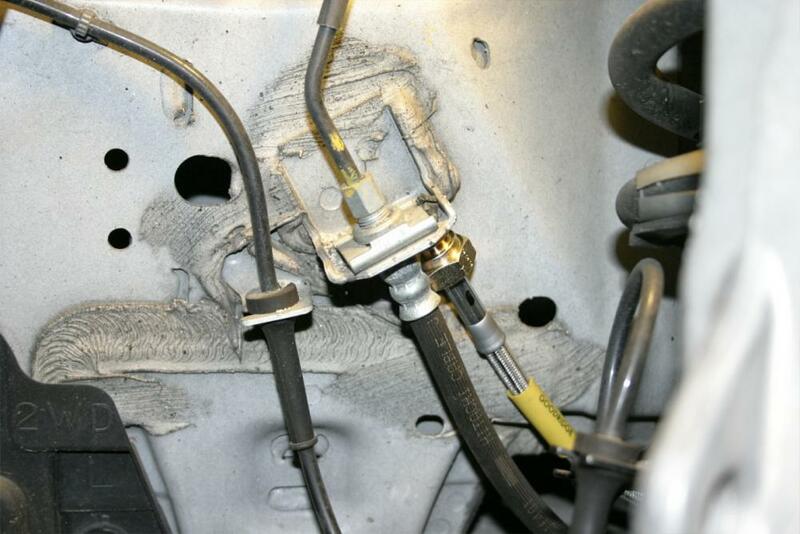 Route the other end of the brake line to the hard line fitting. Crack the old line but don't loosen too much yet or it will leak. 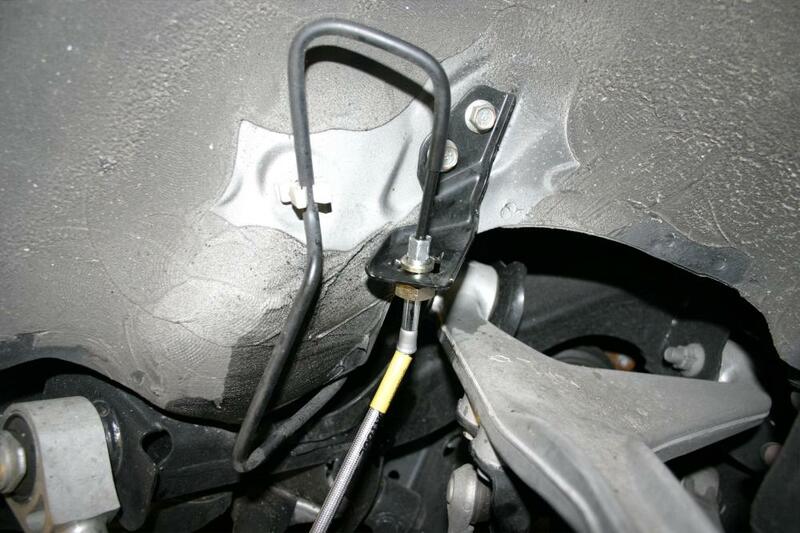 Pry out the old brake hose clip using a large flat screw driver. 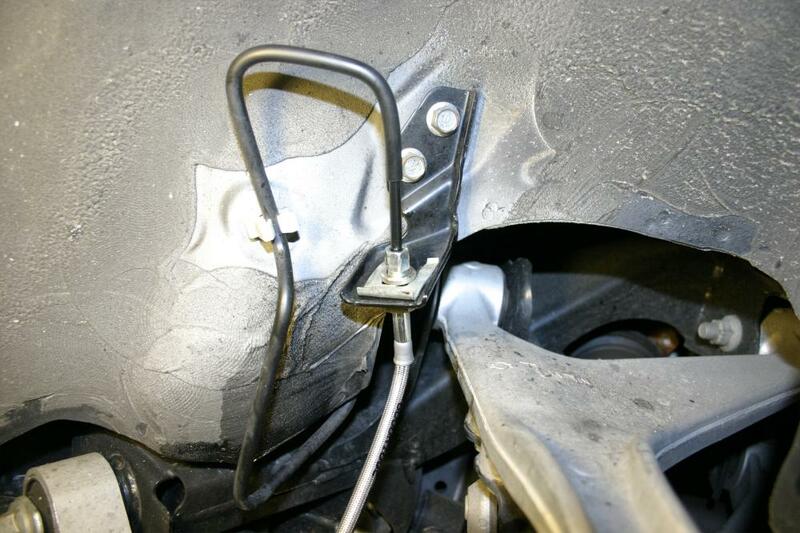 Attach new SS brake hose to line through hole and tighten snug but not tight. 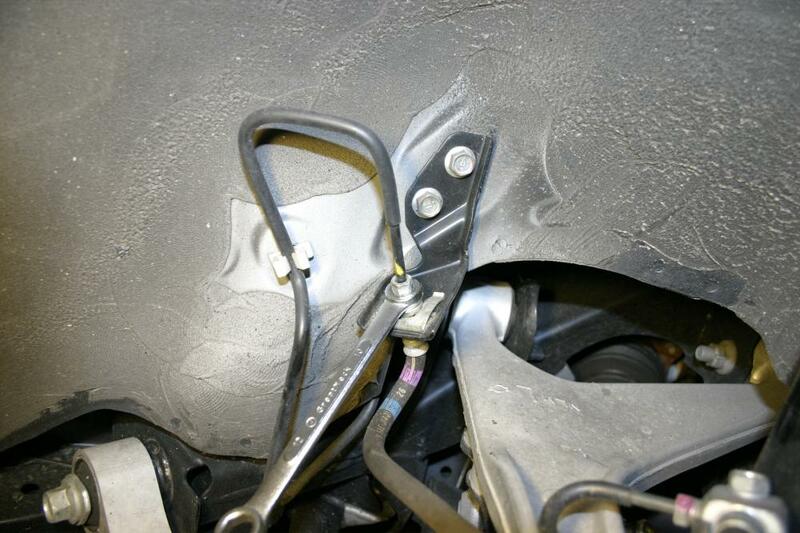 Attach new brake hose clip using small hammer or mallet. 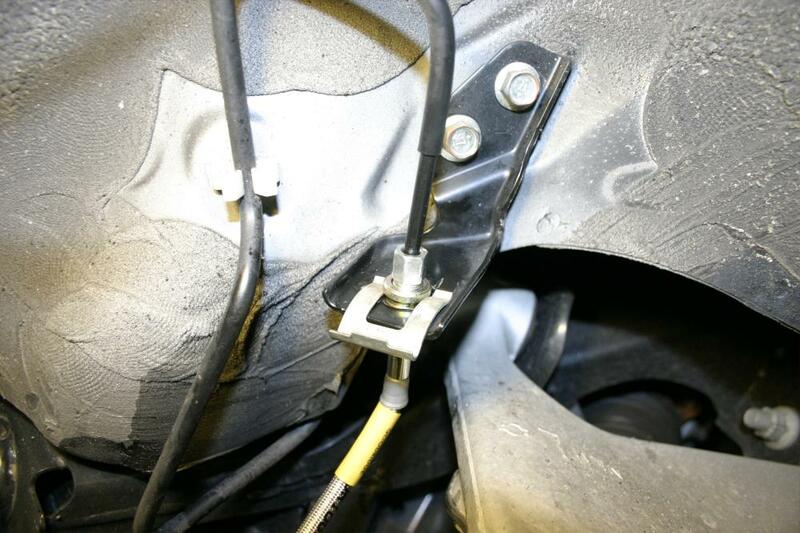 You can now torque the brake line fitting down to around 10 lb/ft. Not too tight as you can damage the fitting causing a leak. Double check the routing of your lines, and your done! 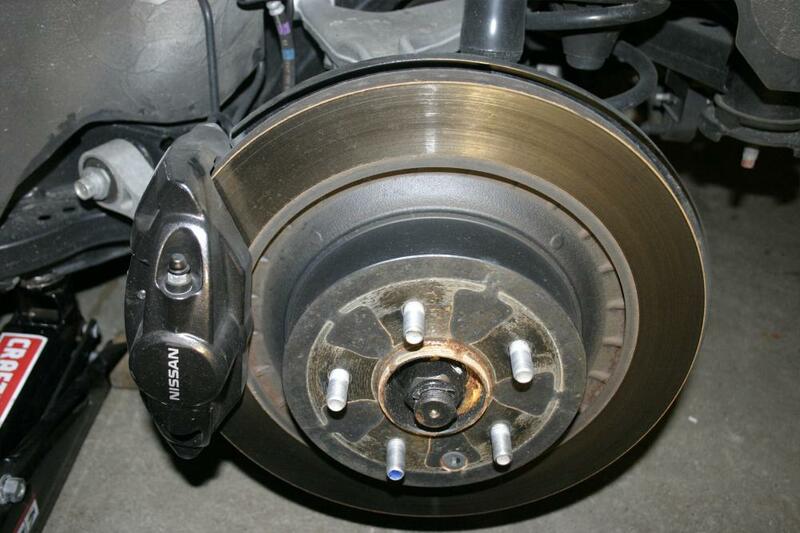 Bleed brakes, clean off fingerprints with brake cleaner, remount wheel. Last edited by ChrisSlicks; 02-02-2010 at 04:44 PM. Jack and support the vehicle, and remove the rear wheel. You'll be presented with something like this. as you remove the last bolt so that it doesn't drop suddenly. 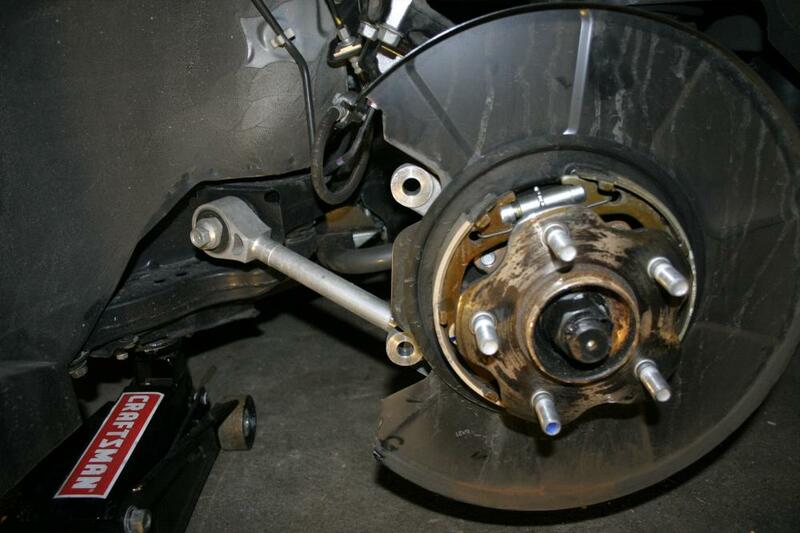 Rest the caliper on top of the control arm for now, and you should be left looking at the rotor. adjustor away from you to loosen. With the rotor off, temporarily mount the adapter bracket to the stock mounting holes using stock bolts. backing plate, leaving a few millimeters for clearance. confirm clearance. 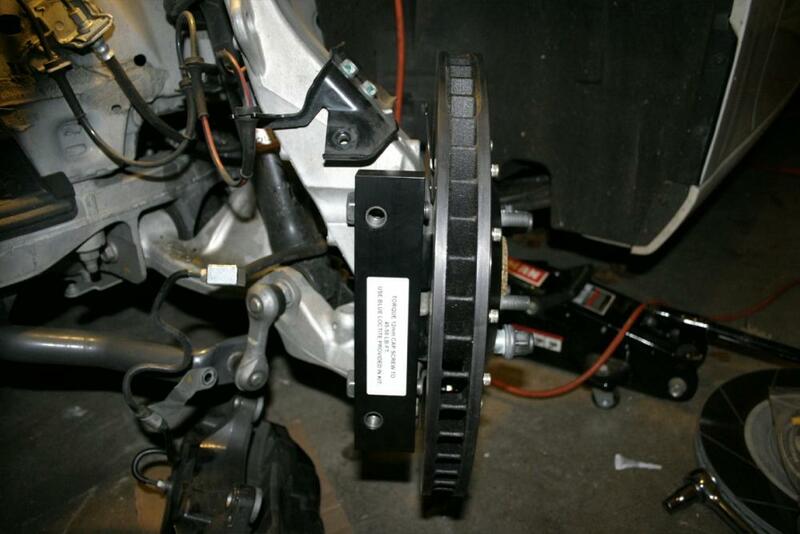 Remount caliper bracket, torque to between 53-71 lb/ft. or 5 clicks. 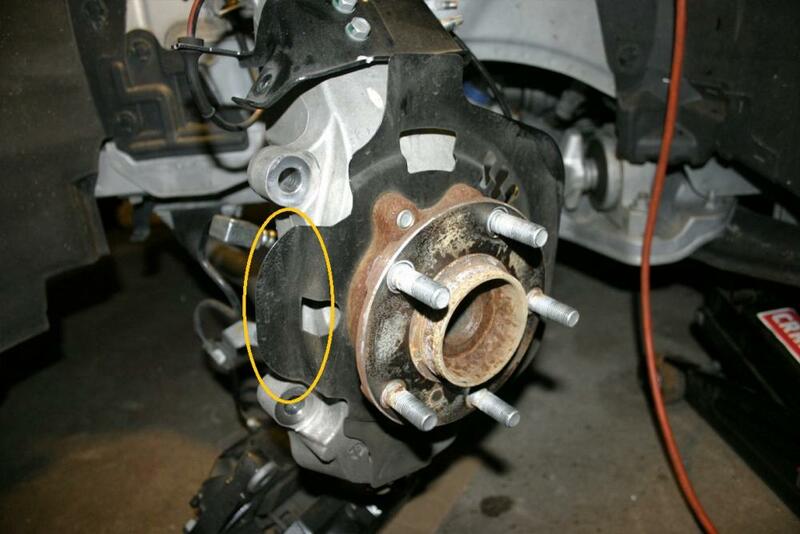 Make sure rotor slides all the way onto the hub, hold in place temporarily with 2 lug nuts. blue locktite to end of threads, torque to 35 ft/lbs. 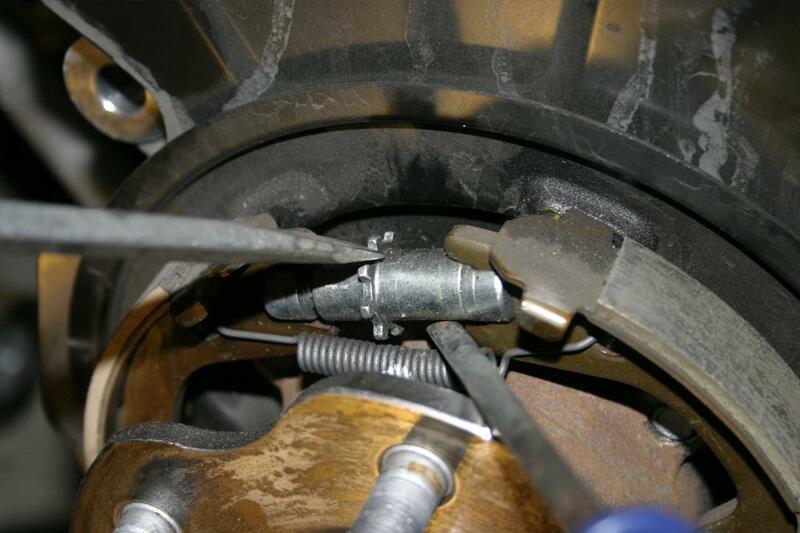 Attach new SS brake hose to caliper using supplied banjo bolt and the 2 copper crush washers, torque to 18 lb/ft. 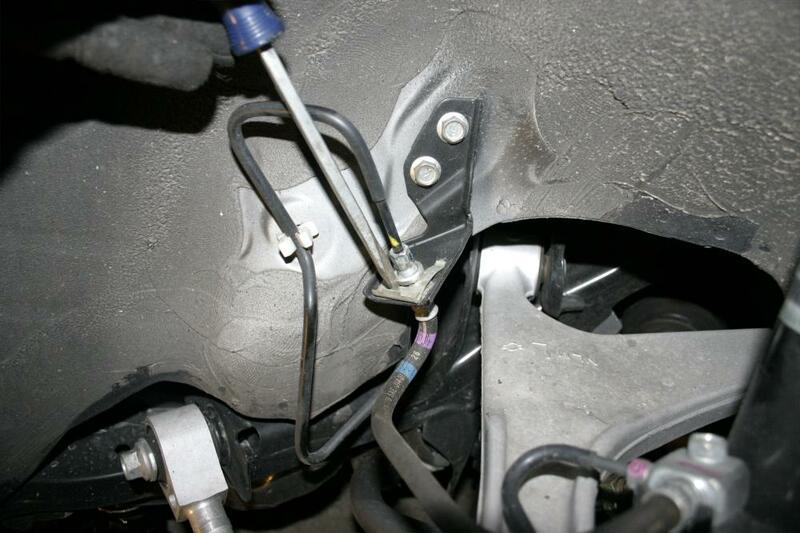 Crack brake line open using 10mm flare nut wrench but keep loosely closed to prevent leaking. 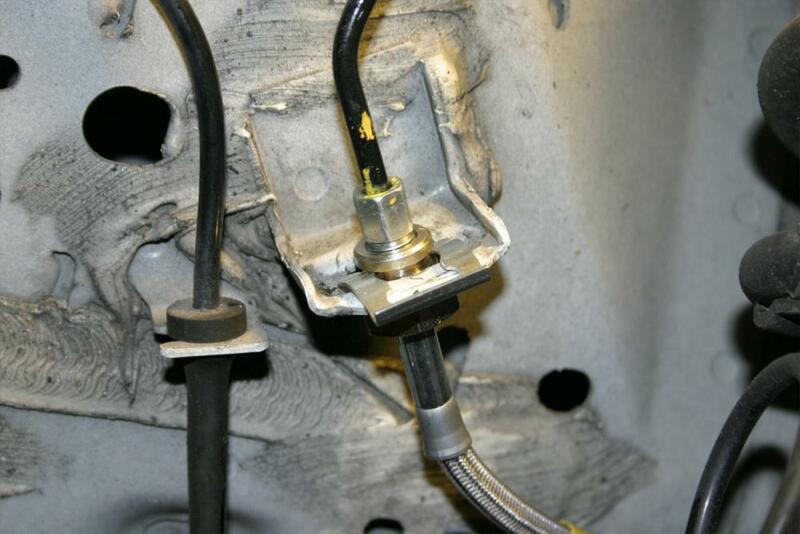 prevent it contaminating your new brake hose. 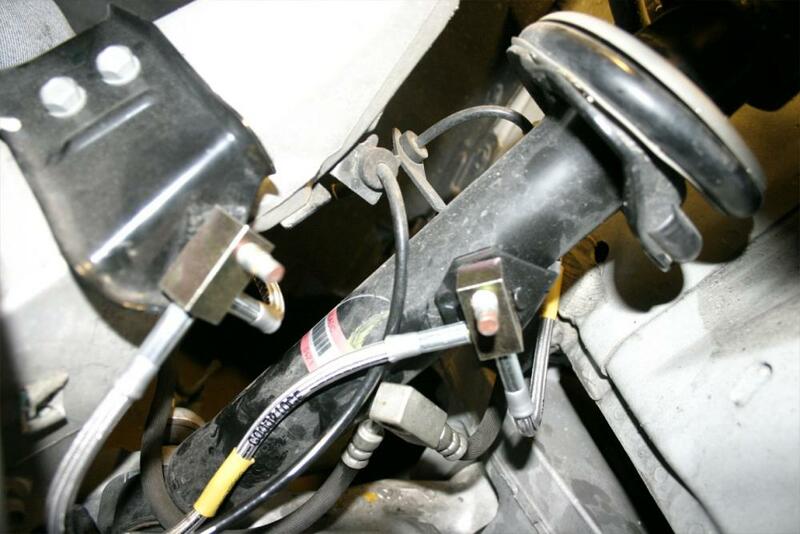 Disconnect stock hose from brake line and connect new SS hose to line snugly but don't tighten yet. Reinstall brake hose clip. Tap it home with a small hammer. 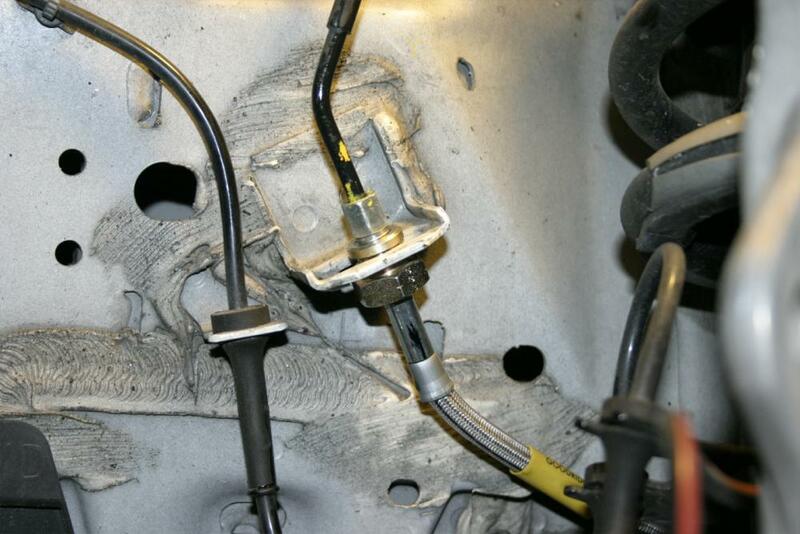 With clip in place tighten brake hose to line, to approximately 12 lb/ft. Don't over tighten! Stand back and admire your work. 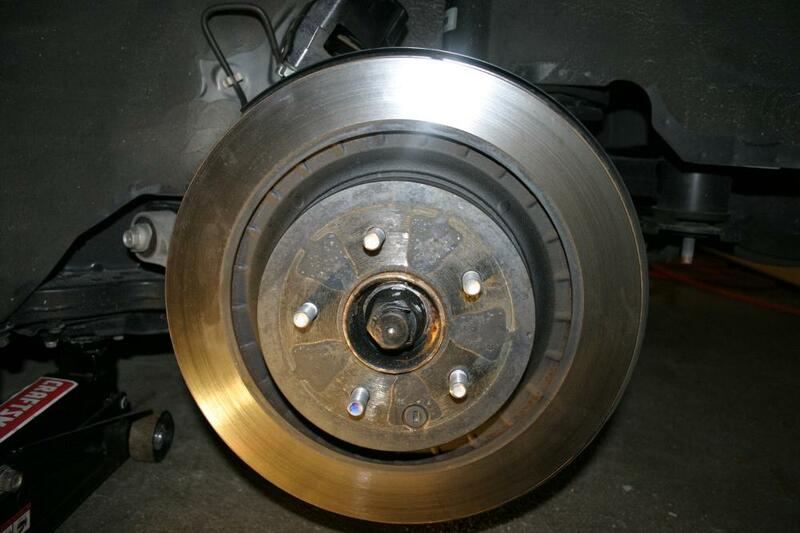 Bleed brakes, clean off greasy fingerprints with brake cleaner, remount wheel, you are done! Last edited by ChrisSlicks; 02-08-2010 at 12:39 PM. Rear install procedure added. The rear is a little bit harder than the front as it involves trimming the backing plate and more than likely adjusting the e-brake. 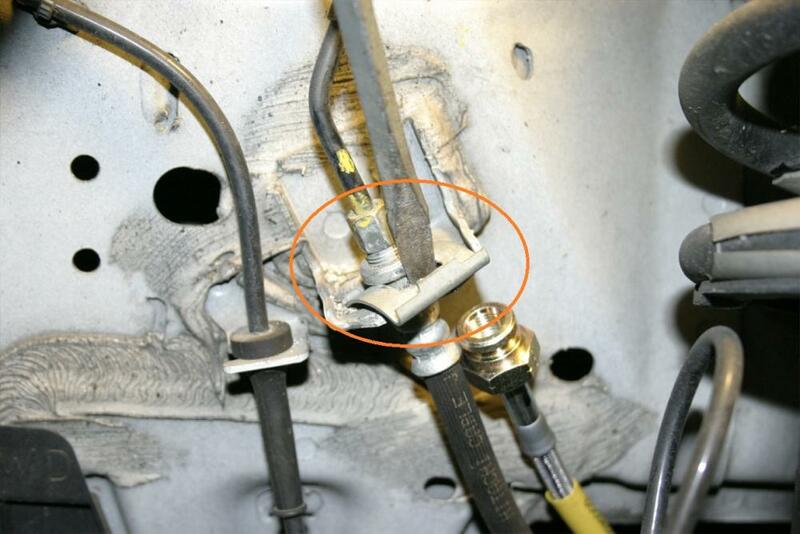 How hard did you find it to loosen the OEM hard brake line from the brake hose? It was a piece of cake, it wasn't over torqued from the factory. Use a flare nut wrench so you have a nice tight hold on it. Yes, my notes are I'm still looking for higher spec pad option, something the equivilant of the Carbotech XP12. If I'm not mistaken the pad profile is D61 for the front, but the rears I haven't figured out yet. 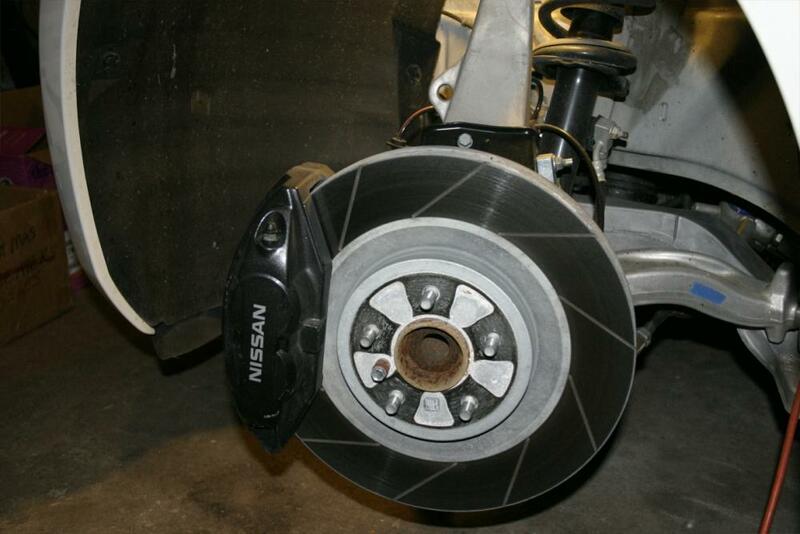 Unfortunately doesn't look like any of those pads have a higher MOT than the Mintex Extremes. At least the DS3000 should have nice consistent bight, with some ducting they could work well. 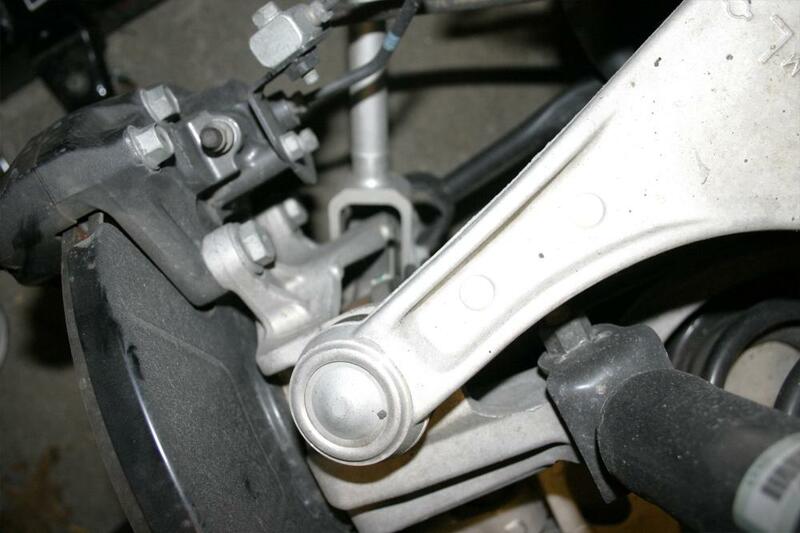 I think a 1300 MOT will be acceptable for 90% of the tracks out there, but there are some that are known for punishing brakes that may require something slightly higher. Sintered race pads are tempting, they're not the most streetable but if you were just using them to drive to the track I think they would do fine. They have a incredibly flat friction curve from 200 - 2000F, require no bed-in and work well in the rain. Only real downside is they are expensive. 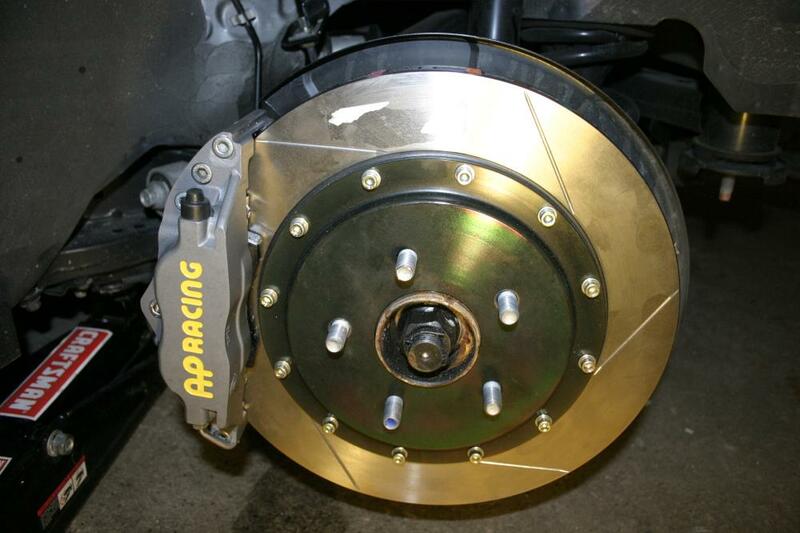 CL Brakes in the UK has a few compounds available, RC8 being the most aggressive but RC6 perhaps being the most suitable for me. Thanks for the write up Chris, I installed my kit yesterday and it was very helpful. Just a heads up, the rear kit has been changed slightly to accommodate smaller wheels. The process is more or less the same but the new caliper bracket must bolted on the inside of the stock caliper bracket instead of on the outside. 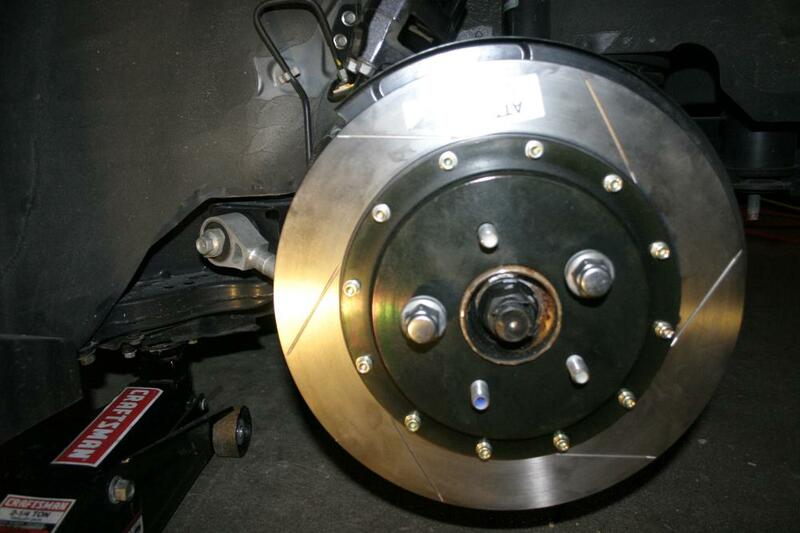 Also the backing plate must be trimmed significantly to accommodate the new rotor. Actually it is mounted on the inside, it's just hard to tell on the pics. Do you have the specs on the new rear setup? 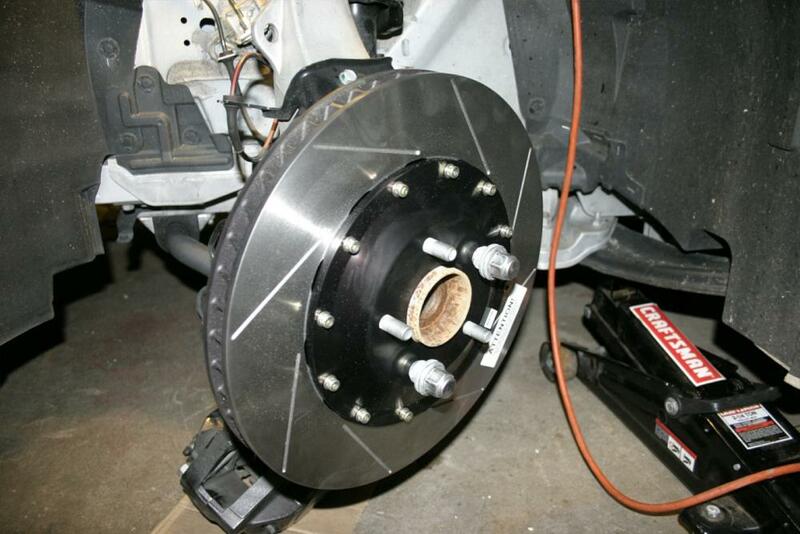 In my setup the rear rotor is actually smaller than stock, 13.25" but the pad swept area is similar.